Rhizosphere acidification is a general response to Pi deficiency, especially in dicotyledonous plants. However, the signaling pathway underlying this process is still unclear. 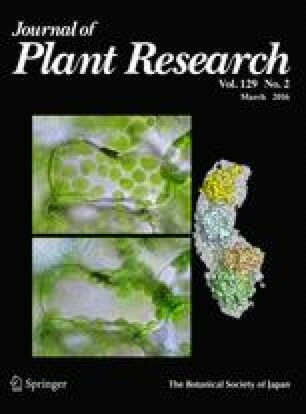 Here, we demonstrate that miR156 is induced in the shoots and roots of wild type Arabidopsis plants during Pi starvation. The rhizosphere acidification capacity was increased in 35S:MIR156 (miR156 overexpression) plants, but was completely inhibited in 35S:MIM156 (target mimicry) plants. Both 35S:MIR156 and 35S:MIM156 plants showed altered proton efflux and H+-ATPase activity. In addition, significant up-regulation of H+-ATPase activity in 35S:MIR156 roots coupled with increased citric acid and malic acid exudates was observed. qRT-PCR results showed that most H+-ATPase and PPCK gene transcript levels were decreased in 35S:MIM156 plants, which may account for the decreased H+-ATPase activity in 35S:MIM156 plants. MiR156 also affect the root architecture system. Collectively, our results suggest that miR156 regulates the process of rhizosphere acidification in plants. The online version of this article (doi: 10.1007/s10265-015-0778-8) contains supplementary material, which is available to authorized users. We thank Professor Jiawei Wang for providing the 35S:MIR156 and 35S:MIM156 seeds. We also thank Dr. Shuping Xing for providing the PromiR156a:GUS and PromiR156d:GUS seeds. This work was supported by the National Natural Science Foundation of China (31371426, 31570263).